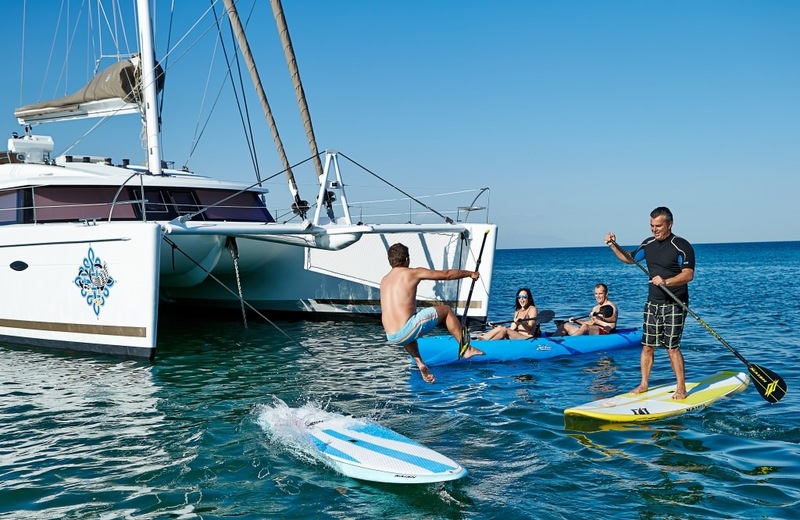 The charter catamaran AZURIA, a 50-foot Lagoon that accommodates up to 6 guests, is offering a discounted price for a 6-night Christmas charter. Azuria knows it can be hard to fit a full 7-night charter in with school and work commitments, so they are offering a 6-night charter at a special rate for the dates Saturday December 21 through Friday December 27. This will give you the opportunity to have a splendid Christmas holiday sailing vacation and be home in time for your New Year celebrations. Azuria is also available for a 7-night charter for December 20-27, 2018. Azuria is a 50-foot Lagoon catamaran with a crew of two. 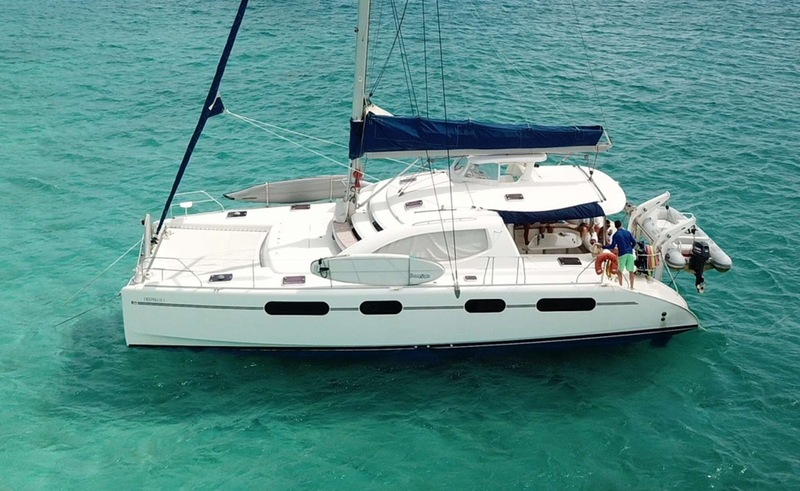 This catamaran is fully air conditioned and accommodates up to 6 guests in 3 Queen cabins each with private ensuite head (shower & electric-flush toilet). The master cabin (aft starboard) has a small seating area & a stall shower. Besides the large aft cockpit, there is a seating area on the foredeck. Azuria has a 14-foot center console dinghy with 40HP motor, waterskis for children and adults, tube (3-person banana), 2 wakeboards, 2-person kayak, 2 standup paddleboards (SUPs), snorkel gear, fishing equipment (BVI registered fishing vessel), 8-person floating island, noodles, beach games, hammock, TV/DVD in salon, iPod dock, onboard wifi where available, etc. NON-SMOKING yacht. 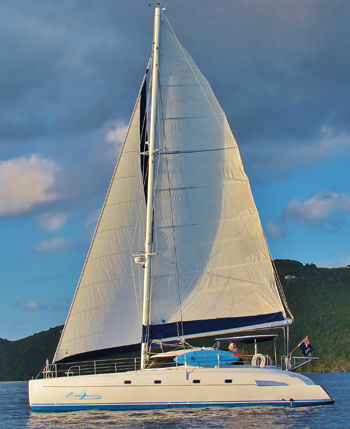 The charter yacht GENESIS, a 50-foot Voyage catamaran, has a special offer for autumn charters in the Virgin Islands. 20% discount for all charters to take place between November 1 and December 15, 2018. Valid for 6-night or longer charters in the Virgin Islands. OPTIONAL SLEEP ABOARD: $200/cabin. Sleep aboard the night before charter dates. $200 per cabin, 2 cabin minimum: boarding after 4PM, welcome cocktails, then dinner to be taken ashore at client expense. Includes breakfast the next morning. Valid for 6 night charter or longer, minimum 2 cabins, may possibly be on mooring. 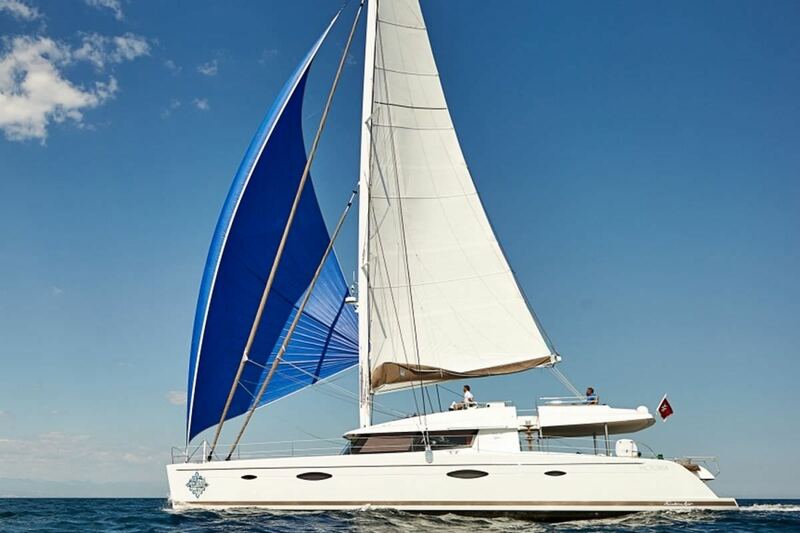 Genesis is a 50-foot Voyage catamaran with a crew of two. Genesis is air conditioned and accommodates up to 6-8 guests. Genesis has three equivalent Queen cabins with private ensuite (shower & electric-flush toilet). Inquire for 7 and 8 guests. Genesis has a 14-foot dinghy with 40HP motor, tube, 2 standup paddleboards (SUPs), beach games, floating mats, iPod dock, inflatable flamingo, onboard wifi where internet is available. Genesis is a BVI registered fishing vessel. The charter yacht DEEPBLUE, a 46-foot Leopard catamaran, has a special offer for autumn charters in the Virgin Islands. OPTIONAL SLEEP ABOARD: $200/cabin. Sleep aboard the night before charter dates. Boarding after 4PM, welcome cocktails, then dinner to be taken ashore at client expense. Includes breakfast the next morning. Valid for 6 night charter or longer. 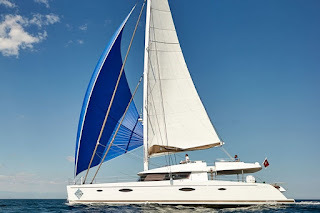 Deepblue is a 46-foot Leopard catamaran with a crew of two. Deepblue is fully air conditioned and accommodates up to 6 guests in 3 Queen cabins, each with ensuite heads having electric-flush toilet and stall shower. They have a 13-foot dinghy with 40HP motor, tube, kneeboard, 2-person kayak, 1 standup paddleboard (SUP), snorkel gear, giant blow-up water toys, noodles, onboard wifi available for email, TV/DVD in salon, iPod dock, etc. 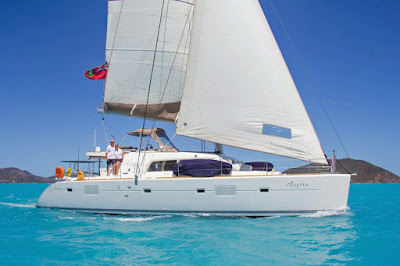 We would like to welcome catamaran Magic Inspiration back into the charter fleet and to announce a special offer. 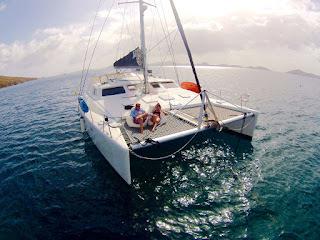 Magic Inspiration is a 46-foot Fountaine Pajot catamaran with Jeff & Sandy, an owner-operator crew of two. Magic Inspiration is fully air conditioned and accommodates up to 6 guests in 3 Queen cabins each with private, ensuite head (shower & electric-flush toilet). They have a 12-foot dinghy with 25HP outboard, tube, two 1-person kayaks, 2 standup paddleboards (SUPs), snorkel gear, underwater camera, acoustic guitar, iPod dock, yoga, onboard wifi, satellite radio, etc. 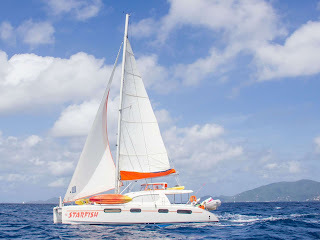 10% discount for 7-night or longer charter in the Virgin Islands taking place in the month of January 2019. Celebrate Valentine's Day on the luxury catamaran LIR, Mid-February is the perfect time for a winter break with your Sweetheart and escape to the Caribbean. Lir is a 67-foot Fontaine Pajot catamaran with a crew of three. This catamaran has a sky lounge, is fully air conditioned and accommodates up to 8 guests in 4 cabins (1 King "owner's suite", 3 Queens). Each guest cabin has a private, ensuite head with shower and electric-flush toilet. Lir has a 13-foot dinghy with 50HP motor, waterskis, tube, wakeboard, 2-person kayak, 2 standup paddleboards (SUPs), snorkel equipment, hammock, iPod dock, TV/DVD, onboard wifi, etc. Lir has a Dive Master and offers 5 dives/wk to certified divers, including gear. The charter catamaran MANGO, a 41-foot Lagoon for 6 guests, sent us a note with a photo. 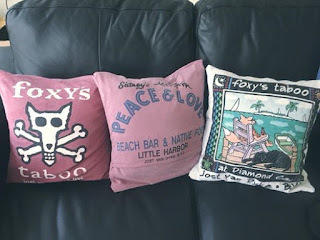 "Last November we were walking to the bubbly pool on Jost van Dyke and found these shirts on the hillside. 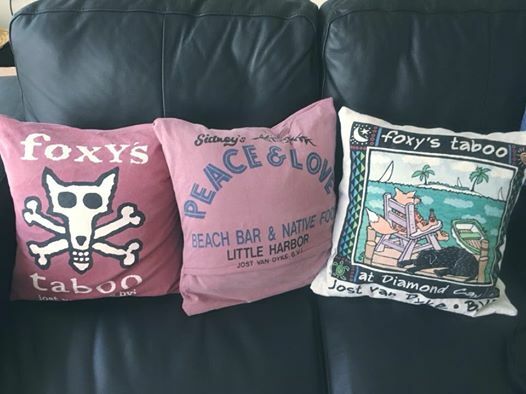 Kelly’s sister, Carrie, made them into pillows." What a great idea! Maybe I'll do the same with our still pristine Jimmy Buffet t-shirts from when we attended the Live In Anguilla concert in 2007. Mango is a 41-foot Lagoon catamaran owned and operated by Captain Kelly and Chef Diane. Mango is fully air conditioned and accommodates up to 6 guests in 3 cabins each with Queen berths and private, ensuite head with shower and electric-flush toilet. They have an 11-foot dinghy with 18HP motor, tube, 2 kayaks, 2 standup paddleboards (SUPs), snorkel gear, floating mats, air sofas, beach games, projector & screen in cockpit for movie nights, iPod dock, etc. Will Definitely Recommend To Others — We Were Pampered Throughout With Great Food, Views, Snorkeling, Etc — The Best Vacation Ever — Best Adventure Of My Life — What A Way To Kick Off A Honeymoon! — Spoiled Rotten By The Mango Crew! — It Really Was The Time of Our Lives — A Wonderful Experience — They Exceeded Our Expectations — The Vacation of a Lifetime! 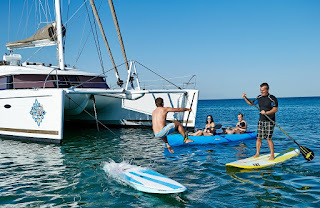 — Great Sailing, Great Food, Great Fun - A Completely Catered Vacation! — The Food Was Amazing! Charter Catamaran Starfish, a 46-foot Leopard with crew of two, has announced their future plans for 2019 and 2020.